The Sacred Page: Was There a Passover Lamb at the Last Supper? Today, Catholics everywhere will celebrate Holy Thursday by attending the Evening Mass of the Lord's Supper. At this Mass, we will read the institution of the Passover (Exod 12, OT reading), sing one of the most famous of the Hallel Psalms (Psalm 118, Responsorial Psalm), and then read the institution of the Eucharist (1 Cor 11, Epistle) and Jesus' act of washing the disciples' feet at the Last Supper (John 13, Gospel). This particular Eucharist is a momentous liturgical moment, where we both recall the institution of the very first Eucharist and enter into the beginning of the calendrical Holy of Holies--the sacred Triduum, climaxing in the feast of Easter (in Latin, Pascha). But how did Jesus and his disciples celebrate the first Holy Thursday? Specifically, was the Last Supper a Jewish Passover meal? As anyone who has read Pope Benedict's new book, Jesus of Nazareth: Holy Week will know, the Pope devotes a substantial portion of his chapter on the Last Supper to the question of the date of the meal--specifically, whether or not the Last Supper coincided with the ordinary Jewish Passover meal (see pp. 106-115). And as anyone familiar with this extremely complex and age-old question knows, there is simply no way I can address it here adequately. Thankfully, I am currently working on finishing a full-length scholarly book on the Last Supper (to be published by Eerdmans), in which I will offer a detailed solution to the date of the Last Supper. In that study, I will draw on the massive amount of contemporary research done in this area and add to it some important Jewish evidence that been neglected. (For some suggested readings on the question of the date, see pp. 214-215 in my book, Jesus and the Jewish Roots of the Eucharist ). 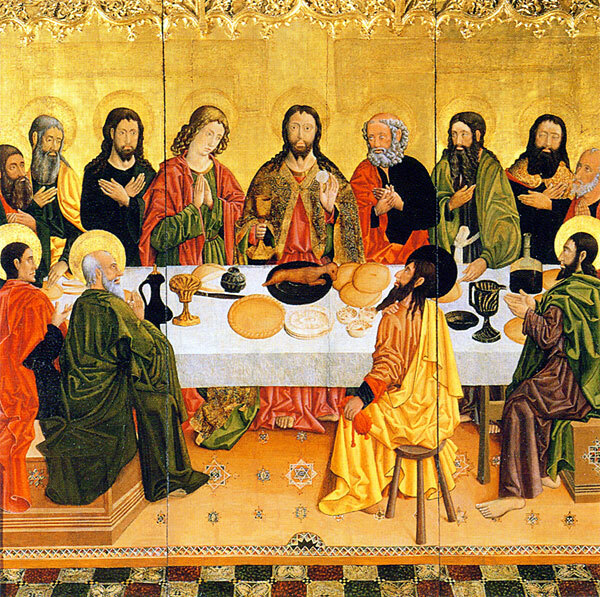 For now, all I would like to do in this post is one brief point about the first Holy Thursday: contrary to what is often claimed by some exegetes, the Synoptic Gospels clearly identify the Last Supper as a Jewish Passover meal--one that included the presence of a passover lamb. Allow me to explain. Anyone familiar with scholarly books on Jesus will be aware that one of the primary arguments against the Last Supper being a Passover meal is that "there is not a word about the lamb" in the Gospel accounts of the institution of the eucharist. In fact, for years, I myself agreed with this view and even have some recordings where I make just that point! Alas, upon closer study of the entire context in the Gospels in their original Greek, I discovered that the idea that there was no lamb at the Last Supper is just not exegetically sustainable. Although the word "lamb" (Gk arnion) admittedly does not appear in any account of the words of institution, both Mark and Luke in particular explicitly testify that there was a Passover lamb (Gk pascha) at the Last Supper. "When they Sacrificed the Passover Lamb (Pascha)"
Though English Bibles translate these with two different words, there is no way for the first use of pascha to refer to the Passover lamb that was sacrificed to be eaten and for the second use of pascha to refer to the now-popular idea of a "lambless Passover meal." The only way to make this work would be to wrench the second occurrence completely out of context. "Go and Prepare the Pascha, that We May Eat it"
Same problem: there is no way I can see in which the first use of pascha in v. 7 refers to the Passover lamb, while in v. 8 pascha refers to a lamb-less Passover meal (if such a thing were even possible in the 1st century A.D.). The meal which they are preparing for Jesus and the disciples to eat in the upper room that evening clearly consists of the passover lamb which had been sacrificed that day. "I Have Greatly Desired to Eat this Pascha with You"
It seems to me that far from the lamb never being mentioned, Luke's Gospel refers to the Passover lamb in the context of the Last Supper some three or four times, both in the account of the preparation and in the account of the meal itself! Now, you can of course always fall back on the claim that all this testimony is historically inauthentic, the creative imagination of the Evangelists and the early church. And of course what I have said in this brief post is no way deals with the question of how to reconcile the Synoptic description of the presence of the Passover lamb with the apparent chronological contradiction with the date of the Last Supper in the Gospel of John. (In order to get my answer to that sticky problem, you will have to read the longer Eerdmans book on the Last Supper :). But all that is a completely different issue from whether or not the canonical Gospels ever claim there was a Passover lamb at the Last Supper. And the fact is Mark and Luke are crystal clear on the matter. 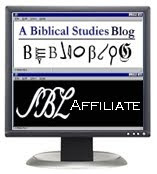 Again, the only way I can see to maintain that there is "no mention" of a lamb at the Last Supper is to (a) only read the Gospels in translation; (b) isolate the words of institution from their surrounding context; (c) completely ignore the accounts of the preparation on Thursday afternoon; and/or (d) reject these accounts as unhistorical. Some combination of these is, of course, exactly what many treatments of the Last Supper that claim there was no lamb present do. So, in closing, perhaps there is some wisdom in the selection of readings that the Liturgy of the Church will lay before us tonight. When you are listening to the accounts of the Passover in Exodus, singing the Passover psalm during the Responsorial, and hearing Paul's account of the words of institution, do not forget to recall how the Gospels say Jesus himself prepared for that momentous night, by sending Peter and John into Jerusalem to "prepare the pascha." May our desire to partake of the new Passover grow to be more like his own, as we journey toward the great feast of the eternal Pascha, the feast of Easter. P.S. : Note that the Master of Perea's icon of the Last Supper [featured above] includes the presence of the Passover lamb. That's one reason I used it on the cover of my book. It's also just a rockin' icon. Thanks for the post. I can't wait to read the "big" book on the Eucharist. My question is, did they (Peter and John) have the lamb sacrificed in the Temple and if so were they the only ones to do so, since John tells us when Jesus was being crucified it was the time of Preparation for the Passover? In your book will you be addressing the possibility of the Last Supper being celebrated with the Essenes, on a Tuesday, rather than Thursday (an Idea I had first heard in a class with your colleague, Dr. Bergsma)? Didn't the Passover begin on the evening and carry over to the evening of the next day, like the Jewish Sabbath? It is unthinkable that the Jews would have arrested and tried Jesus DURING the day of the Passover. The gospel of John makes it clear that Jesus died just BEFORE the Passover. I heard a talk by a rabbi who said that the CAtholics had it right when they called the host the Lamb of God; he said that for the poor and for those of the diaspora, the Jewish authorities said that the unleavened bread was a substitute for the lamb. Another thing: how about the idea that the day starts the evening before....many could have their Passover supper that evening, and the next day celebrate with the Temple sacrifice. Great question, Paul, though to answer it completely, I would need to have recourse to the sixty page single-spaced chapter (!) on the date that I have in the long book on the Last Supper. For now, I would just emphasize that both Luke and Mark (Mark 14:12; Luke 22:7) explicitly set the preparation for the Last Supper on the day when the lambs were "sacrificed" (Gk ethuon)--something which by biblical law could only be done in one place--the Temple (see Deut 12). Yes, Peter and John appear to have been the only ones to do so, both because Jesus was keeping the location of the Last Supper secret from Judas--he had a sacrament to institute, after all!--and because, as Josephus tells us, one Passover lamb could be sacrificed on behalf of a group of no less than ten, but no more than 20. The 13 at the Last Supper fit this model perfectly. Only Peter and John would have needed to enact the preparations. Carl: Yes, in the Eerdmans book, I will have an extensive treatment of each of the major solutions to the date of the Last Supper, including A. Jaubert's Essene hypothesis, as expounded by my dear colleague, Dr. Bergsma! I will analyze there both the strengths and weaknesses of each position, and explain where I come down. Cassandra: even if there were evidence that Diaspora Jews at the time of Jesus celebrated a lambless Passover (I have yet to find any), that would not apply to Jesus and the disciples in Jerusalem. Indeed, the Gospels make quite clear that Jesus sends Peter and John into the city when the lambs are sacrificed precisely so that they can eat the Passover (Mark 14:12; Luke 22:7)! If he could do it without a lamb, they could have just celebrated in Bethany, no? Positively, I will also bring Jewish evidence to bear which is consistently ignored, showing that certain executions were in fact required to take place during feasts like Passover. I will also address in detail the verse to which you are referring, John 13:1: "Before the feast of Passover, Jesus, having loved his own who were in the world, loved them to the end..." The question I have is: What would "before the feast of Passover" have meant to a first-century Jew? 13 Nisan? the afternoon of 14 Nisan? Brant: could it be that "pascha" means the passover meal, and not specifically just the lamb? Brant: I think we need to take into account that "pascha" frequently means "Passover" and not specifically the passover lamb. For example, Luke 22:1 says "The Feast of Unleavened Bread was near, which is called 'Pascha'" So "to eat the Pascha" need not mean "eat the lamb," it could mean "eat the Passover." I must admit that I always thought there was no passover lamb at the Last Supper. But Brant's arguments are devastating to that view. I might wish to hold it for theological reasons, but I would have to admit, exegetically, it is problematic. For Mark, you "they sacrificed the pascha". That doesn't seem to be bitter herbs! It seems impossible to interpret that as something other than the lamb. So isn't it significant that the very next line has "eat the pascha”? Can you really argue that it is probable that the second occurrence should be read as referring to something other than the lamb? Is it really likely that "pascha" means two different things . . . only a few words apart from each other in both accounts? Likely? I think you have to say no--and ultimately, exegesis isn't about finding any possible meaning, but the most likely one. I'd love to hear what you think though. How is it more likely that the two occurrences of "pascha" mean two different things in both accounts? What evidence is there to support that view? Why not Passover on the solar passover on Tuesday with many people. Why can’t Peter and John go to the Temple and offer a lamb for a peace/thank offering Lev 7:11-15 Only the blood of the sacrifice is offered with the unleavened bread adn wine and go a prepare it as a passover lamb. I am sure there were many sacrifices in the days before the passover. There were easily more than 13 people at the last supper because Cleopas (Luke 24:18) and the other disciple “recognized” him by the break of the bread. Cleapas was probably Joseph’s younger brother and the husband of Mary of Clopas and the father of Jesus’ brethren. Only someone at the last supper would recognize this breaking of the bread. Both Peter and John could have offered a sacrifice and there be 40 people at the Least Supper. Remember it was a large room. Certainly both Barsabbas, and Matthias were also there. I don't understand why either of Luke's comments must or even should be taken as referring to the lamb itself. Although the Passover would typically demand a lamb being sacrificed, wouldn't it suffice that Jesus is the lamb that was eaten. This is not to say that the disciples would have understood this at the time. Nor did they most likely comprehend why they were not drinking the cup of consummation, for that matter. But it seems that Jesus was the lamb. As the pascha had to be sacrificed for the Passover meal to be valid, would it not suffice for the pascha to be referring to the Lamb of God who takes away the sins of the world? Then, there could be no literal lamb apart from Jesus and still have a consistent use of pascha in Luke 22: 7-8. Also, what day of the week are you proposing for the Last Supper? Thanks for this, Brant. I just read Ratzinger's section on the dating of the Last Supper on Tuesday, so it was fresh in my mind. "What is the meaning of pesach? FATHER: "Pesach means the paschal lamb..."
Having just read your post, it was confirmation. Blessings on your Triduum. Michael: I have a response to that, but we can talk it over next weekend in Arlington! :) We are all working out of the same paradigm, which is to take seriously the truth and inspiration of Scripture. Without meaning any disrespect, I wonder why it is important that the Last Supper be a Jewish Passover or that a passover lamb be present in the meal? This is a reference to the Last Supper, is it not? Therefore, the Last Supper is not a Jewish Passover. And for us to cling to this idea seems illogical since it is not necessary and because it is easier to harmonize the Scriptures otherwise, since the Synoptics are not explicit about the matter, either way. But Jesus frequently said things which had double meaning. And I believe that Jesus was here referring to the first Christian Passover. The first Mass. Actually no, what is revealed explicitly in that text is that the Disciples were going to prepare a lamb for the Jewish Passover in which they intended to participate. There is however, nowhere in any text, where the Last Supper is explcitly identified as the Jewish Passover. And as you say elsewhere, Jesus had a Sacrament to establish. In my opinion, Jesus did not intend to participate in the Jewish Passover, He knew He would be dead by then and dying fulfill the Jewish Passover and establish the Christian Passover.